All transactions are safe and secure with a reliable history in online purchasing behind each of our associates. Buy the Laguna Beach Dunzo t-shirt to own Laguna Beach clothing and merchandise. 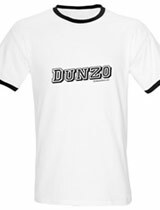 The front of this MTV Laguna Beach t-shirt displays the word "Dunzo" across the chest. Dunzo is a common term used in Laguna Beach and other areas of Orange County, California. It is a slang word meaning done/finished. After Kristin Cavallari's car overheats, she exclaims, "My car is so dunzo!" Stephen Colletti uses the term when he talks about he and Kristin's impending break-up, "Kristin and I are dunzo," says Stephen, referring to the fact that his romance with Kristin is over. Purchase this tee to show you're down with the lingo of the OC. In addition to the Laguna Beach Dunzo tee above, browse the Laguna Beach Clothing Gallery for more apparel like men's and women's clothes, kids shirts or hoodies.